Long balloons are typically used by clowns or performers to create balloon animals. They have a longer body than round balloons and can sometimes be difficult to blow up because they are so long and narrow. While hand pumps are OK to use, especially by beginners or hobbyists, for the professional it is quicker to blow up a balloon by mouth and tie it off quickly. Some professionals can even blow up more than one at a time. It just takes a little bit of knowledge and practice to blow up long, skinny balloons. Put the balloon between your lips. Do not put it between your teeth, only your lips. 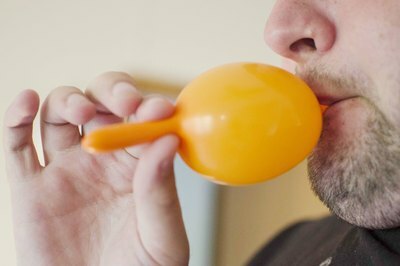 Squeeze the balloon with your thumb and first finger about 2 inches past your lips. Make sure your palm is facing out, away from your face. Blow up just a small portion of the balloon, forming a small bubble. Stretch the few inches you are holding while you blow out a few more inches. Pinch the nozzle closed at your lips, and take a deep breath. Blow into the balloon, trying to fill it with one breath. Use your stomach muscles, not your cheek muscles. If you use your cheeks, you will only hurt your face and pop your ears. Use your free hand to test the balloon for any weaknesses. 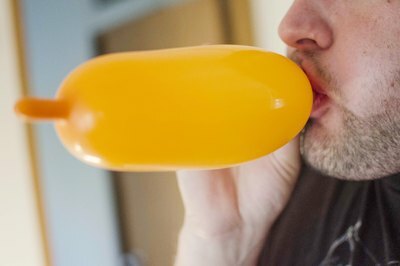 If you find a thin portion of the balloon, do not use it; it probably will burst before you finish using the balloon. 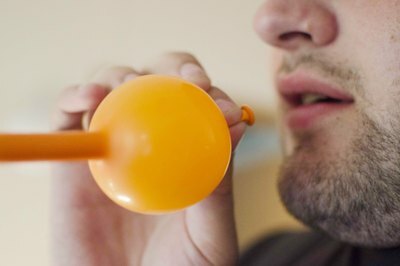 Blow until the balloon is at the proper inflation for what you need. If you can't start it by yourself, use a small hand pump just to get the balloon started. Wear safety goggles when first learning to blow up long balloons. You don't want to get your eye snapped if the balloon pops while blowing it up. Breathe in through your nose. Do not forget to breathe while blowing up the balloon. Practice a little every day. 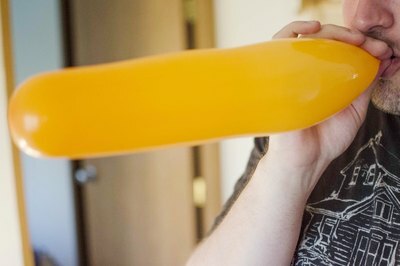 It may seem easy, but blowing up long balloons needs practice and a gradual buildup before you can do it easily and quickly.